U Work 4 Utah uses creative methods to influence partisan elected officials representing Utahns to act in accordance with the moderate views of their constituents. Like Donald Trump, Mia Love uses her Twitter feed to promote her work in her official capacity as a federal employee, but then she selectively tries to censor constituents who express differing opinions. 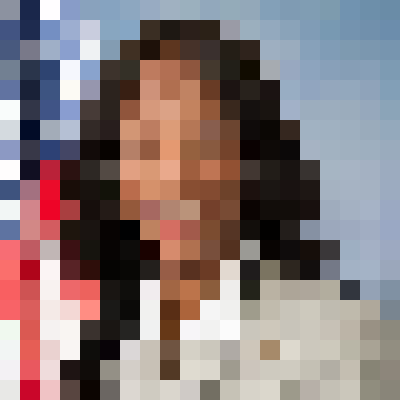 We've launched a Twitterbot, @RepMiaBot that automatically re-tweets all messages from both of Congresswoman Love's Twitter accounts, @RepMiaLove and @MiaBLove. If you follow @RepMiaBot you can read all of Love's tweets, even if she has blocked you. If she hasn't blocked you yet, follow @RepMiaBot and then you can block Mia Love! We launched these billboards in prominent locations in her district. Donate now to help keep them up longer! 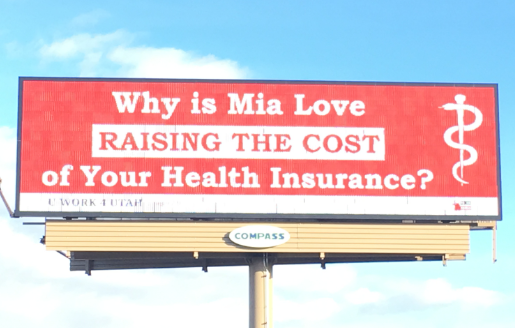 For 7 years Mia Love has been promising to fix the problems with our current health care system. Since being elected, with a majority Republican Congress, Senate, and a Republican President she has failed to deliver ANY change. Health insurance premiums continue to rise, and in fact, because of the uncertainty she and her colleagues have introduced into the health insurance market, premiums are rising even more! Read our latest Op-Ed on the Utah Delegation's failure on healthcare in the Salt Lake Tribune. We pushed to get a moderate elected to replace Jason Chaffetz. 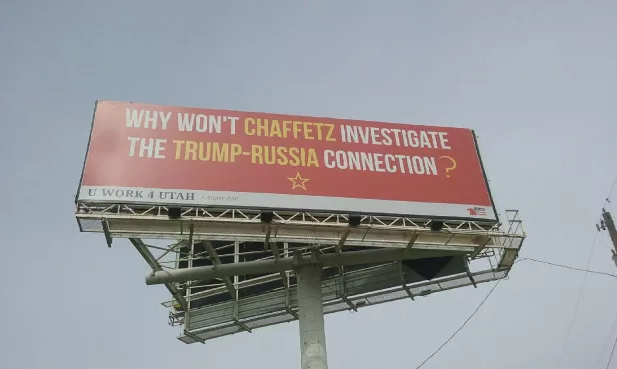 Our first action, launched a billboard that helped convince Chaffetz it was time to go! We were featured in the Salt Lake Tribune, Washington Post and the Huffington Post.